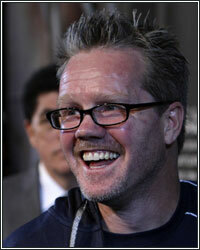 FREDDIE ROACH: "THE GYM IS CLOSED...HE'S NOT TAKING THIS GUY LIGHTLY!" "No! The gym is closed," remarked world-class trainer Freddie Roach when a reporter asked him if it would be okay to pay a visit to Wild Card gym to catch a glimpse of pound-for-pound champion Manny Pacquiao as he prepares for his upcoming May 7th showdown with "Sugar" Shane Mosley. Having just arrived at Los Angeles International Airport, Roach was left to deal with questions from a throng of reporters as Pacquiao slipped out the side door unnoticed to avoid the crowd of fans who showed up hoping to see the Filipino superstar. "That's why we're here," Roach added with a smile, pointing out that despite , training at the Wild Card gym in Hollywood, California still provides far fewer distractions than Baguio City in his native Philippines. Still, regardless of any distractions that they may have already experienced, Roach is extremely pleased with how training camp has gone thus far. "We had a great start. He's very motivated. His intensity is great. We're just going to pick up the sparring a lot here and the motivation is going to be the same," he explained. With the intensity of sparring sessions set to pick up, it's obvious why Roach is closing the gym to outside observers while Pacquiao trains. Despite Mosley being a heavy betting underdog, Roach is keen on the fact that his many years of experience makes him dangerous, so they're training for him as though he's the toughest opponent that Pacquiao has ever faced. "He's not taking this guy lightly. He knows the guy has the experience. Experience is knowledge and we can't underestimate Shane Mosley," he continued. "He's going to give us his best, I'm sure, and we expect him to be at his best, and we're going to be at our best, so we'll be careful." For much more of what Freddie Roach had to say during Team Pacquiao's arrival at LAX, check out the full video at MPBoxing.com.